The table in this picture serves as overview of everything that we can change on an app page. Thus, these are the tools for ASO. Search optimization or search visibility, refers to all of the areas you can work on to improve how an app ranks for a keyword that is used in queries. For example, you can improve your app title or description. The keyword list in the iOS store is another field that deals with search optimization. Conversion optimization refers to the areas of the page that may not necessarily help in search, but help in converting visitors to users. 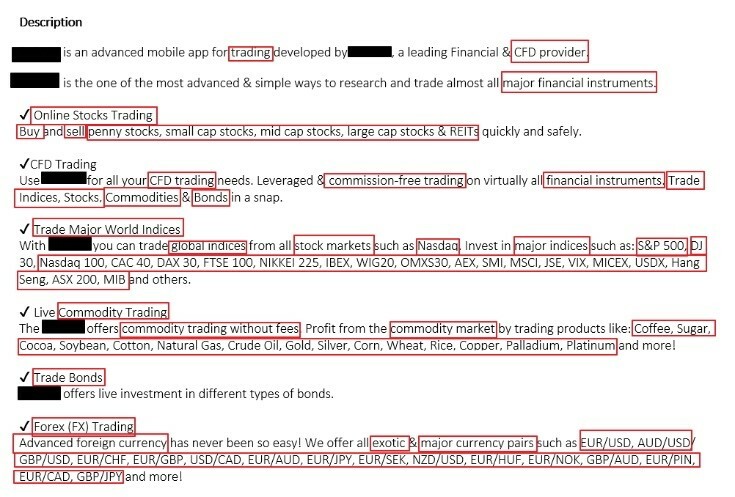 This includes everything that is concerned with visible texts (not the iOS keyword list) and graphics. For example, an icon may catch a visitor’s eye in the initial search and aesthetically pleasing screenshots may entice him or her to install the app. Some of these features, like titles for instance, overlap and we’ll discuss this a little later when we explain the best practices for each of the fields. What does all of this really look like? Let’s take a look at a live version of the things we’ve been talking about. What you can see here is what we like to call the “ASO canvas”. The iOS and Google Play app stores are different in appearance and, as such, optimizing them is a different process. If you take a look at the “above the fold” area, or the first screen’s view on your mobile phone, in both stores we see the app title, the publisher name, and the reviews. But the rest of the information is different. On the left in iOS, the first two screenshots from the app are by far what take up the majority of screen space. The icon is large as well. In Google Play on the other hand, the feature graphic at the top is what is noticeable at first glance. t the bottom of the screen is additional information like the app’s category and number of downloads along with a short description. As we scroll down, in iOS there is a description and a “What’s New” section if the app has it. In Google Play, we get “What’s New” and screenshots. In both stores, users have to actively tap on “read more” in order to see the full description. ARE YOU AN EXPLORER OR A DECISION MAKER? An interesting fact about how users make decisions here: about 50% of users are “instant decision makers” and the other 50% are “explorers”. Instant decision makers come to an app page, see what it looks like and, within a matter of seconds, make a decision of whether or not to download. Explorers on the other hand, take time to open the screenshots and scroll through them to get a better understanding of the app’s functions. Interestingly, only about 1% of users will actually hit “read more” on a description in Google Play. It means you need to make sure your app pages are highly aesthetic and appealing. You need to use what little space you have to tell a story about the experience of your app for those users who are going to take the time to look, read and learn. 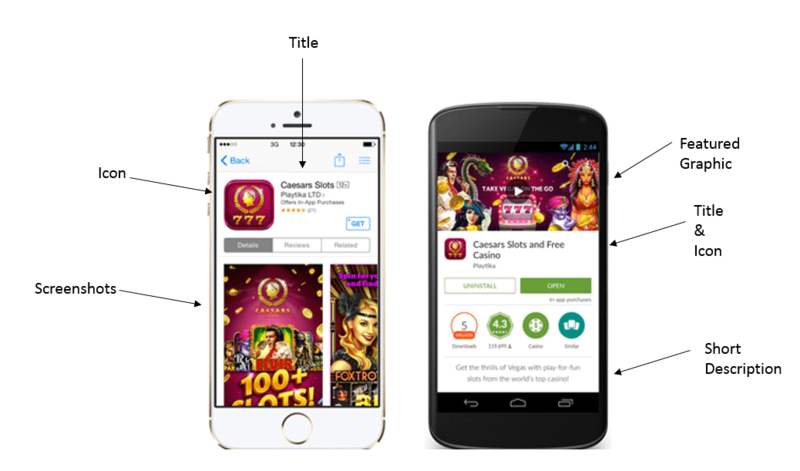 HOW DOES AN APP STORE FUNCTION? One of the biggest areas of focus in ASO is comprehending the searches that occur in app stores and how app stores’ algorithms treat those searches. Generally speaking, users type in queries to find apps. These users look for certain features (i.e. English keyboard, trading stocks, pedometer). When a user types in a query that is related to your app, your app should appear in the search results. It is vital that your app is ranked as highly as possible within the results to gain visibility and installs. Since there is so much emphasis on ranking well for searches that are made in app stores, we need to have a firm understanding of how search engines work. We know that Google Play and the iOS Store use algorithms to rank results. These different algorithms have the same goal, which is to give the user the best experience possible and keep them happy. So how exactly do app search engines determine a best experience for a user? How do they try to keep users happy? Each search query entered activates a sort of competitive process, where each app receives a score that illustrates its experience for the specific query made. Essentially, all the apps in the app store compete every time a search is typed in! 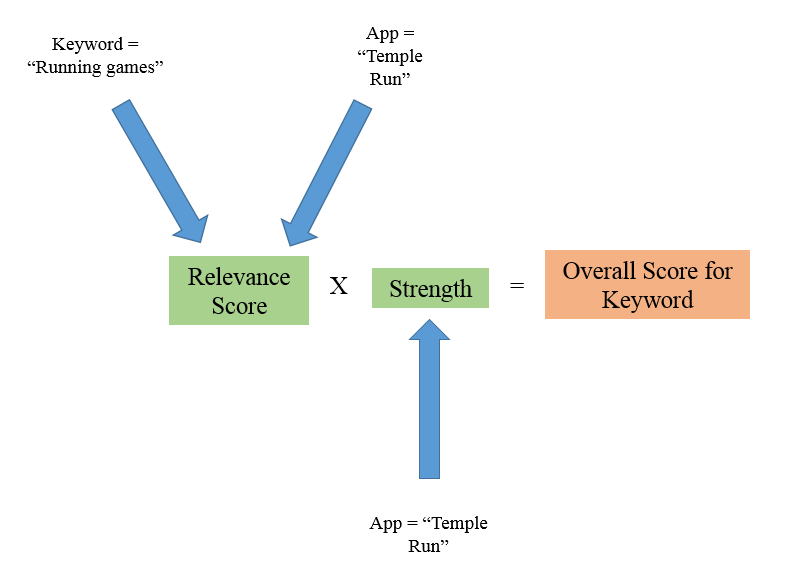 Apps compete for a given keyword in the following way: App stores calculate the experience for a given query based on the interaction between relevance and strength. Relevance has to do with how suitable an app is for a given query. There is a relevance score that is calculated for each keyword that is used in a query based on the app that addresses that keyword. For example, the common query of “running games” is very much related to the popular game “Temple Run,” since the goal for players is to keep the avatar running and rack up points. Relevance is a key place where ASO services focus their efforts; picking titles and keywords that are related to the experience an application will provide makes an app more likely to succeed. App store search engines do their best to figure out what your app is about. In order to do that they use algorithms and scan every bit of information that they can, to determine what is important about your app. The title of the app holds the most power in terms of relevancy. It is the first thing that users see and it has a character limit. Therefore, app stores assume that the words you pick to use in the title are the most relevant to your app. The words in your app’s title strongly affect your relevance score, which in turn affects the app’s keyword ranking for the words in the title. The keyword list is only found in the iOS store. It is a list of 100 characters, and those words explicitly specify what the app is relevant to. The app descriptions (applies for keyword rankings only in Google Play) are important to the relevance score of your app. The Play Store scans an app’s description in search of keywords. Since this field has more text, and less users look at it, Google deems keywords in the descriptions as less powerful than keywords in the title. 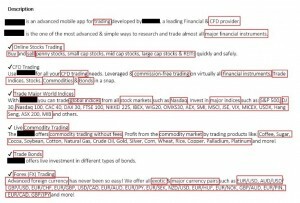 Nevertheless, words in the description will be deemed as keywords. The fact that the description field offers more space makes it a good place to integrate long tail keywords. This is in stark contrast to the iOS Store, where keywords can only be specified in the keywords list. 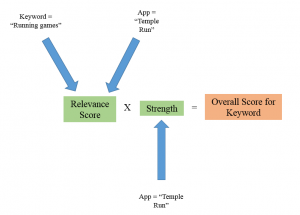 The relevance score of an app for a certain keywords can be affected by the app’s category. The category field is another bit of information that app stores use to determine your app’s relevance for a given query. This is important because users often type in queries that are also category names. For example, apps that belongs to the category “card games” will be ranked for the query “card games” even if they don’t have those words listed in the title or description. A field that, at first glance, does not seem to be related to relevance is the developer name. This is yet another field that will tell app stores what type of app you may upload. If you are going to create a new developer name, you might as well make it work to your advantage. Adding words like “games” to your brand name in the developer name field tells the store that the apps you upload will be of a certain nature. Click through rates (CTRs) have what to do with relevance as well. The CTR is the percentage of searches that lead to page views or the percentage of page views that result in installs. You want your app page to be successful enough to drive visitors to download the app. Let’s say that a lot of people who search for “keyboard” found your keyboard app, downloaded it and enjoyed it (did not uninstall or give it a poor rating). In this scenario, you will be ranked higher for the keyword “keyboard” because of your CTR for that query. The number of installs your app has throughout its lifetime is an indication of whether or not it is popular and successful. Installs within a more recent time period carry larger weight than installs from several month or years ago. An increased rate of installs in the recent past signals that the app, as it is right now, offers a good experience and is therefore strong. The quality and quantity of reviews also affect an app’s strength. The more positive reviews an app has received, the more it is deemed as strong and trustworthy. Stores presume that an app that made past users happy (they rated it 5 stars) will also make future users happy. This is why app stores are more likely to rank high rated apps in top spots. Just like with installs, the number of all-time reviews as well as recent reviews affect an app’s strength. This, in turn, affects the app’s keyword rankings and installs. There are additional factors that affect whether or not an app will be strong and create the best experience possible for a user. Outside of the US, this includes whether or not an app is localized. We will elaborate on this subject later on, in a chapter dedicated to this. In Google Play, the number of back links to your app also influences its perceived strength. What this means is, if your app is referenced on blogs, tech websites or social media outlets, the Play Store believes your app is generally a good fit for users. Similarly, the number of Google pluses an app earns influences its strength. These are similar to “likes” on Facebook, and are another method for satisfied users to provide positive feedback. 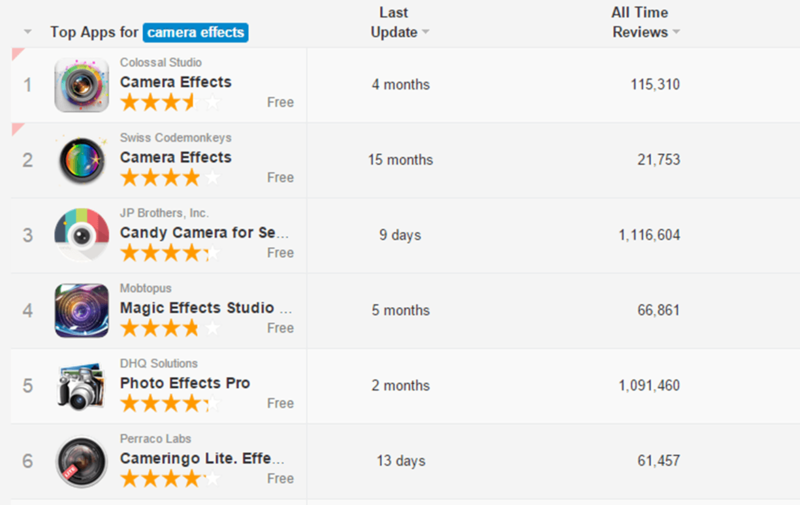 Above are the results for the search query “camera effects” in the US iOS store. This data was pulled using Sensor Tower’s keyword research tool. Notice how the first two apps have an exact match of the query in their titles. Because of this, they are very relevant for this search query, which means they have a high relevance score. However, compared to the app in the third ranking, the first two have fewer reviews and lower ratings; this means that the third app likely has greater “strength” than the other two. The iOS store considers the third app as less relevant for this search query, since it does not contain an exact match in the title. In this case, in the battle between the strength and relevance, relevance wins. Now that we know how search engines function on a rudimentary level, we will explore how ASO accomplishes the goal of increasing organic traffic for an app in a more comprehensive manner in the next chapter.